On the Fourth of July, I took a look at Diamond Select Toys’ Marvel Select line’s version of Captain America. I wouldn’t want Cap to be lonely, so how about giving him a buddy. And who better than Cap’s bestest friend ever, Bucky Barnes! Okay, actually it’s Winter Soldier, but they’re actually the same person (umm….spoilers?). Anyway, Marvel Select just got a comic version of Winter Soldier, released to tie-in with this summer’s Captain America: The Winter Soldier. Let’s see how the figure turned out! 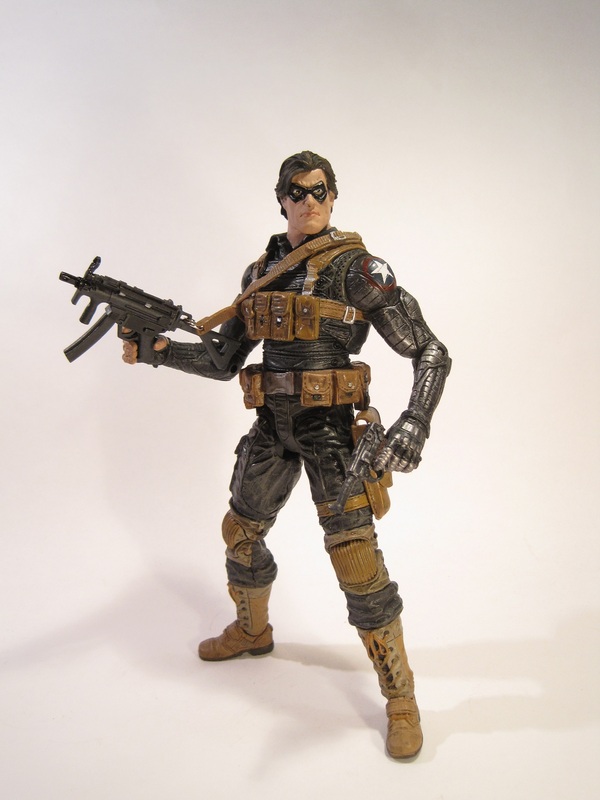 Winter Soldier is a Disney Store exclusive from the Marvel Select line, released in early 2014. 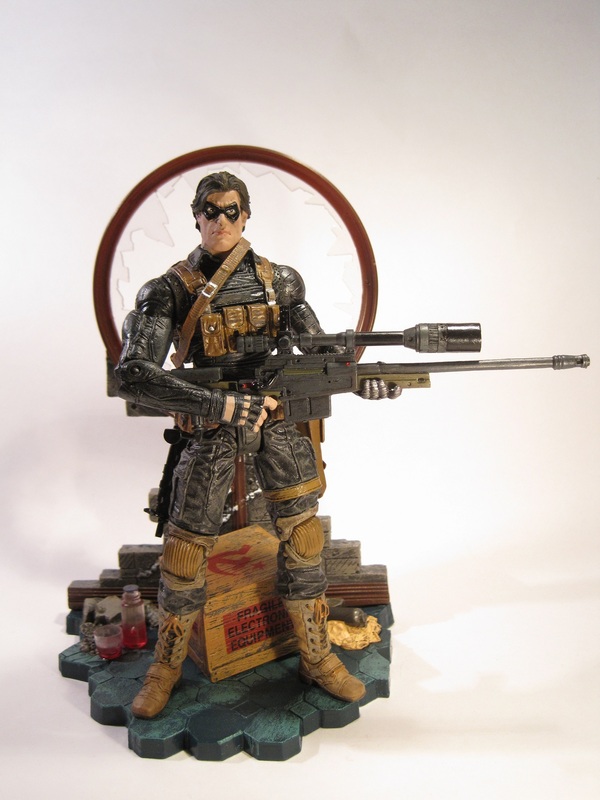 The figure stands about 7 inches tall and features 29 points of articulation. I believe he’s meant to be based on the Soldier’s most recent look, which is an amalgam of his original comic look and his look in Captain America: The Winter Soldier. The figure features an all-new sculpt, and a pretty good one at that. Right off the bat, it’s a more consistent sculpt than a lot of previous Select figures, like Captain America for example. It’s not a perfect sculpt; the chin is perhaps a bit too large, and the arms are a little gangly. Other than that, it’s a great piece of work. The Soldier’s costume allows for lots of textures in the different types of material used in the uniform, and the sculpt handles them all very nicely. The move to a new style of hip joint is probably the greatest thing about the figure, especially looking at the direction of the line as a whole. 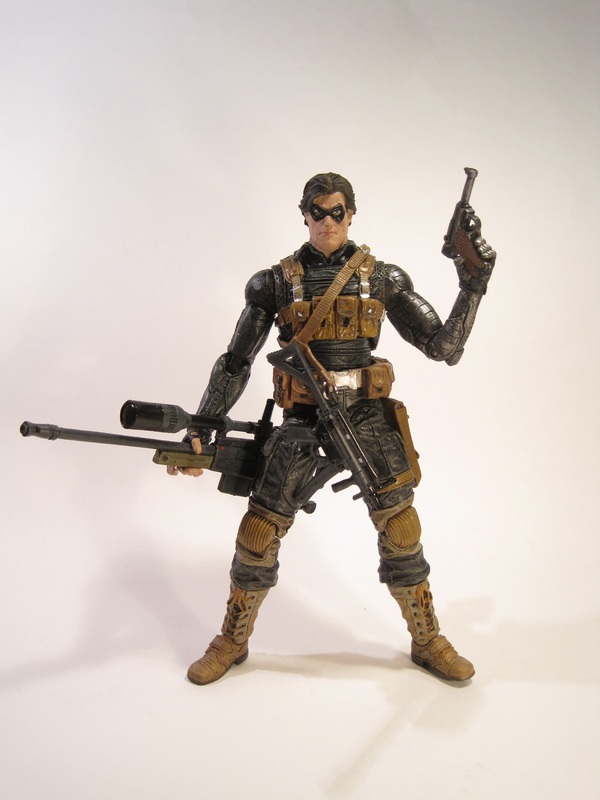 The new joint is similar to those seen on a DC Universe Classics figure, and it allows for a better range of movement without interrupting the sculpt. I do wish the range of motion was a little bit better on the ankles, but they aren’t terrible. The paint work is pretty decent. There’s no real occurrence of slop or bleed over, and there’s a lot of nice texture work that really accents the sculpt well. 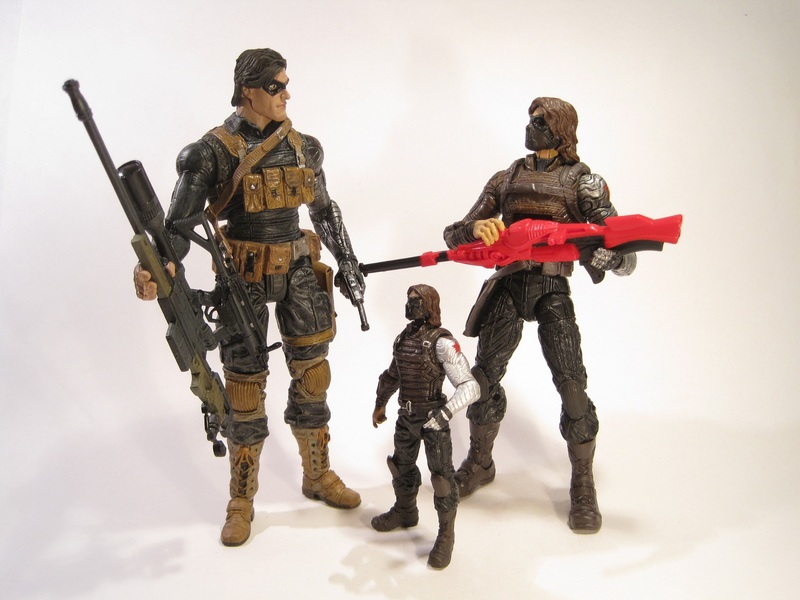 Winter Soldier features a nice assortment of accessories, which include a sniper rifle, a handgun, a submachine gun with a strap, a crate with Russian markings, and a stand made to look like a section of wall and floor. 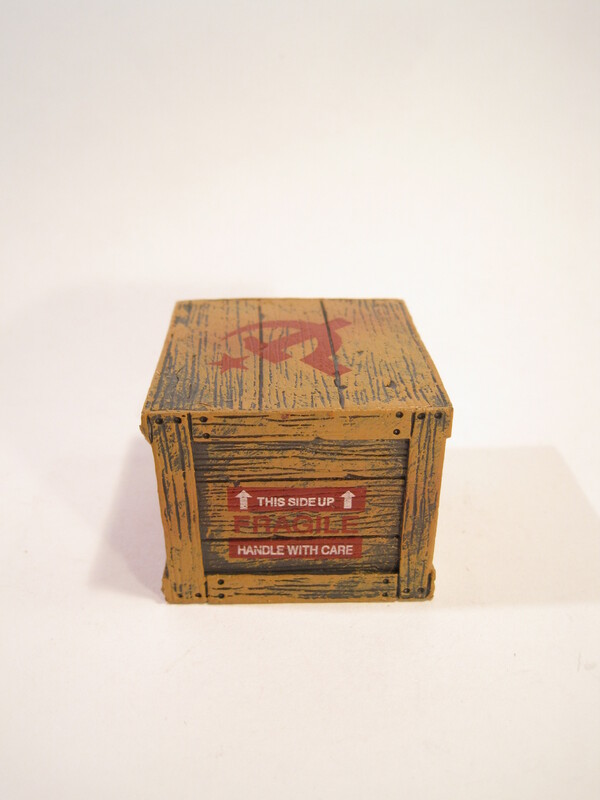 The crate in particular is quite impressive, just due to the impressive amount of details present on almost every side. I picked up Winter Soldier from the Disney Store at the local mall. I was there to take care of a few other things and my friend Tim wanted to stop in the Disney Store to look at the new Guardians of the Galaxy Nerf stuff, which he had spied through the window. While he was looking at those, I happened across the store’s Marvel Select display. I had seen pictures of this guy online, but hadn’t thought much about it. I’m at best a moderate fan of Winter Soldier. Before this year I didn’t even own a single figure of him. But, seeing the figure in person was enough to sway me. I’m definitely glad I decided to get him; he’s probably one of the best figures the Marvel Select line has to offer, and he’s just a pretty great toy in general!